Each year grade 10 students sojourn to the Bucknall campus to meet up with their grade 3 Eagle Buddies at the lower school’s annual Pajama Day Assembly. The event, held in the gym, celebrates a grade 3 service project in which students collect items for the Pajama Program, a national nonprofit organization dedicated to providing new sleepwear and books to kids waiting to be adopted. Over the past nine years, to make life a bit better for children living in local shelters, the lower school has donated thousands of items to the program, according to representatives of the Pajama Program’s local chapter. Although the drive is primarily a grade 3 effort, all lower school families are invited to participate by dropping off items in the gym’s lobby. Prior to the assembly, Ken Allen, lower school dean of students, urges parents to encourage their children to help the less fortunate by donating a new pair pajamas or book to the program. 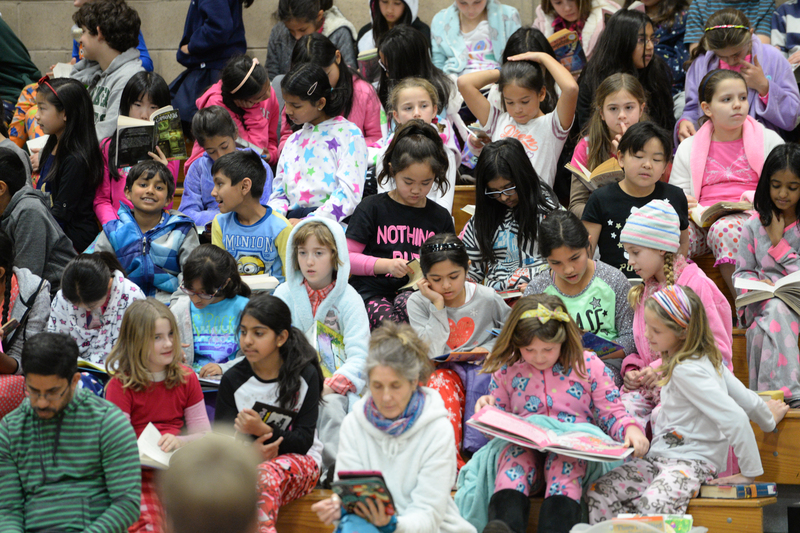 This year’s assembly occurred on a special-dress pajama day a couple of months ago, when all students and faculty were encouraged to wear their favorite jammies to school. Butch Keller, upper school head, kicked off the assembly by reading the book “Courage,” a story about bravery by author and illustrator Bernard Waber. Students enjoyed hearing the story, and seemed equally enthralled with seeing Keller in his robe and slippers, seated in a rocking chair on the stage. Shortly after, the third grade students had the opportunity to read a book with their upper school Eagle Buddies, who also had been encouraged to bring items to donate to the Pajama Program. Wearing a colorful assortment of robes, pajamas, slippers and knit hats, the grade 3 students and their big buddies then headed outdoors for lunch, socializing and field games. Her grade 3 pal, Bahar Sodeifi, said that she really likes the Eagle Buddies program and always looks forward to having the “big kids” come over for a visit. Keller created the Eagle Buddies program to help bridge the upper and lower school campus divide. The buddies stay together for three years, until the sophomores graduate and the third graders matriculate into middle school. The pajama and book drive originally began at the suggestion of Rishi Narain, grade 12, who got the idea for the project when he was in grade 3, after watching the “Oprah” show. The show’s guest that day was Genevieve Piturro, founder of the Pajama Program. Narain was motivated to bring the cause to Harker, where he helped organize the inaugural donation drive.